Digital cameras are trying hard to push back against the growth of smartphone photography. But few decisions are more complex than picking out the right digital camera among hundreds. You could easily fill five articles of this length with the ins and outs of camera technology. With that in mind, this acts as a handy overview for the average shopper looking for a camera. Camera classifications aren’t completely consistent, but it is possible to tease out some broad categories. There’s some debate over these terms so consider them a rough guide to what you’re going to find. One step up from the smartphone you carry in your pocket are point-and-shoot cameras (sometimes just called compacts). People usually buy a point-and-shoot for the ability to zoom, or to have access to things like a better flash or faster autofocus than a smartphone can provide. What was once a vital market of $200-400 compact cameras has shriveled significantly because most people are happy using their phones and don’t care much about the difference in quality. However, if you’re willing to drop over $600, there are a few high-end compacts that provide near pro-quality results. These include the Sony RX100 series, and the Canon G7X. At the top end are two different types of cameras. The traditional DSLR (digital single-lens reflex) offers the fastest autofocus, burst shooting rates, and flexibility in choosing from a wide range of lenses. However, they are large and heavy to carry around. 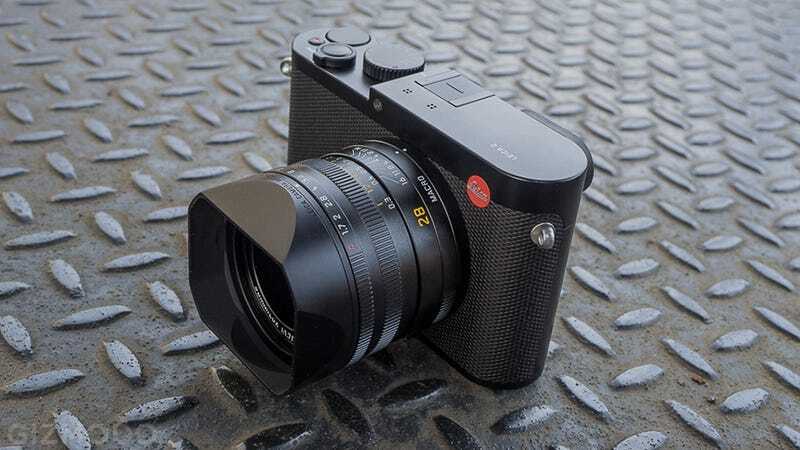 Mirrorless cameras have been slowly taking the place of DSLRs among enthusiasts because they are much more portable while offering the same overall image quality in many cases. They also often times offer more innovative features like 4K video recording or connectivity options. They’re “mirrorless” because they don’t use the mirrors inside DSLRs to reflect light into a viewfinder. That cuts down the size and weight dramatically, though they still have interchangeable lenses. There’s nothing to say ambitious beginners with enough cash shouldn’t splash out on a DSLR or high-end mirrorless, but be prepared to do a lot of learning if you’re going to get the most out of your new toy. Here’s a handy video for just such a task! Finally there are the bridge cameras (sometimes called superzooms). They offer a really long zoom range and some advanced features in a smaller body than a DSLR, and without the hassle of switching lenses. Most bridge cameras offer fairly low quality images, just like the languishing point-and-shoot category, but there are a few high-end options that create professional results. These include the Sony RX10, Panasonic FZ1000, and upcoming Canon G3X. Choose a bridge camera if you have more money to spend and really want to shoot things that are far away. The high-end models mentioned above are also excellent for video, which makes them great options for do-it-all family photography. The biggest determining factor of image quality is your camera’s sensor size. The sensor is the light-sensitive silicon chip that replaces film inside a digital camera. The bigger and more expensive your camera, the bigger and better the sensor is likely to be. Phones and most point-and-shoots use sensors that are a fraction of an inch in size. Their image quality is limited. Higher end compacts and bridge cameras use 1-inch sensors which are a significant step up. Mirrorless camera sensors and DSLRs have even larger sensors, with the cream of the crop being a full-frame 35mm sensor, which provides the best low light performance and overall quality. Then there’s the lens—on some cameras you can swap lenses out, while on others you’re stuck with what you’re given. You’ll see reference to focal length, determining the lens’ angle of view (shorter focal length means wider angles for your snaps). The lens aperture (often an f-stop number) tells you how much light can enter the lens: Larger aperture openings (more light) have smaller f-numbers. If you buy a camera with a larger aperture you have more control over low light shooting and will be able to achieve blurrier out-of-focus backgrounds. Many lenses have aperture ranges, like f/3.5-5.6, which means zooming in sacrifices brightness. The highest quality lenses have constant aperture values throughout the zoom range, like f/2.8. But these lenses are typically bigger and much more expensive. The number of megapixels a camera produces is a measure of an image’s dimensions, and its importance depends on who you ask. Generally speaking, more megapixels gives you more flexibility—you can print at larger sizes and crop without losing too much quality—but for photos that only live on the web it’s not such a crucial consideration. Most people are happy with the 8 megapixels on their iPhone. Optical zoom is simply how far you can zoom in. Digital zoom will always sacrifice quality because it’s basically just cropping the image. The same goes for stabilization. Optical stabilization is superior because the lens elements actually move to compensate for shake. Digital stabilization manipulates the image and can sacrifice some quality. ISO is a measure of how sensitive the sensor is to light. Companies will market the ISO range of a camera, and generally the wider the range the better your camera can shoot in low light, but the sensor size is still a much better determinant of low light capability. The smaller the sensor and ISO range, the more noise your images will have in the dark. Burst rate tells you how many frames you can fire off in rapid succession. This can be anywhere from 4 fps (frames per second) to upward of 10 fps. If you are shooting fast moving subjects or fleeing children, a high burst rate might be beneficial. Autofocus comes in two flavors. Phase detection is found on most DSLRs and is the superior system. Contrast detection is found on most mirrorless cameras and point-and-shoots. It isn’t as good for tracking moving subjects, but it can still be extremely fast for general purpose shooting. Some mirrorless cameras have hybrid systems that offer very fast focusing. You might also see a camera advertised with how many AF points it has. The more the better. Also look for face and eye detection which is handy for shooting portraits. There are a few other features to weigh up before you part with your cash. A viewfinder that you put your eye to might be important to you, and not every camera features one. If you’re the outdoorsy type, weather-proofing on the camera can be important for resistance to water and dust. Wi-Fi is becoming standard on most new digital cameras, but GPS, like you get with your smartphone, is not as widely available because of the added cost. Then of course there’s price. You could just go out and find the best camera you can afford, but it’s not always that simple—shortlist a few cameras and read as many reviews as you can, particular ones that include sample photographs (Flickr is another good resource for this). Don’t put too much stock in the photos you see online. Remember, almost any camera can take really great photos, it’s the skill of the photographer that counts.